Parameter and Feature: Size: Apple Watch Regular Length (fits 5.50'' - 7.08''wrist) （14cm~18cmwrist） Materials: Single Tour Genuine Leather & Metal Adapter Applicable crowd: Women / Men Compatibility: Compatible with Apple Watch Series 1, Apple Watch Series 2, Apple Watch Series 3 sport & edition version 38 mm Suitable occasion: Company, office, business, dinner party and other formal occasion. Package included: cailin watch band with 2 adapters only, not including Apple Watch. PERFECTLY MATCHED: The adaptor precise connection Apple watch. Freee spring adaptor more easy install and take it out. Perfect for Apple watches Series 1, Series 2 and Series 3. DURABLE: The Apple watch band surface coating guarantees long life and a high level of protection against and absorption of humidity, Super soft. 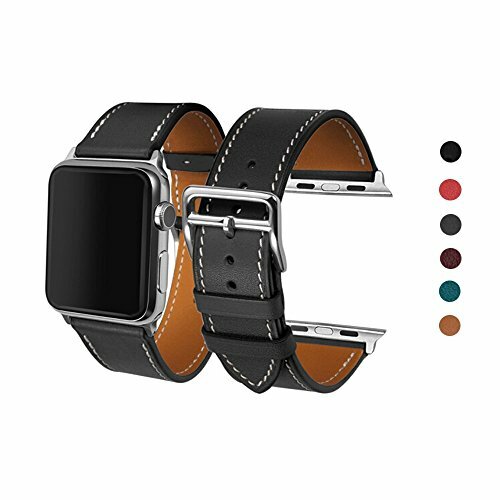 Top Leather Iwatch Strap - This fashionable Watch band features high quality craftsmanship with a comfortable feeling of genuine leather on your wrist. Includes anti-slip and sweat absorbent 100% leather. Standard Wrist Size - The band is made for standard average wrist size between 164- 215mm. If you have any questions about this product by CAILIN, contact us by completing and submitting the form below. If you are looking for a specif part number, please include it with your message.